tl;dr: Bitcoin’s price has risen sharply in recent weeks, but its movement follows slowing venture capital interest and measured consumer adoption. Bitcoin’s price is back in the news, rocketing from the $400s in May to north of $750 in June before retreating under $700 today. The famous cryptocurrency managed to reach price levels not seen since February of 2014 before its modest pullback. Why the spike? Theories abound. However, the rally itself cannot address the issue at the heart of bitcoin’s ecosystem: Consumer adoption. Today, we’re taking a quick look at what might have caused the rapid change in the value of bitcoin, followed by a check-in on both investments and use of bitcoin itself. Consensus says that bitcoin’s recent price surge is due at least in part to the impending halving of the supply of new bitcoin, which will occur in under three weeks. Miners, the individuals and corporations who manage the computers running bitcoin’s blockchain, will soon receive half the number of bitcoin that they previously did for the same work. This reduction is built into bitcoin’s DNA, and the impending halving is not a surprise. The anticipated slower production of new bitcoin may have shifted the cryptocurrency’s supply and demand balance, pushing up its price. Naturally, the incentive to mine new bitcoin would be reduced if bitcoin failed to maintain its recent price gains. Past the impending halving, other theories concerning the cause of bitcoin’s recent rally include worries about increasing Chinese corporate debt, and the potential of a Brexit. In those cases, bitcoin might act as a form of hedge. Whether it’s wise to choose bitcoin for that purpose is debatable given its price volatility. Rising price aside, bitcoin’s key challenge remains that it isn’t very popular among average people. Two well-funded startups, Blockchain and Coinbase, claim around 13.5 million bitcoin wallets—not active users—between them. Together, they have raised nearly $140 million. For perspective, back-of-the-envelope math estimates that there are 175 million Americans alone with credit cards. The upward slope in the above chart is worth noting. 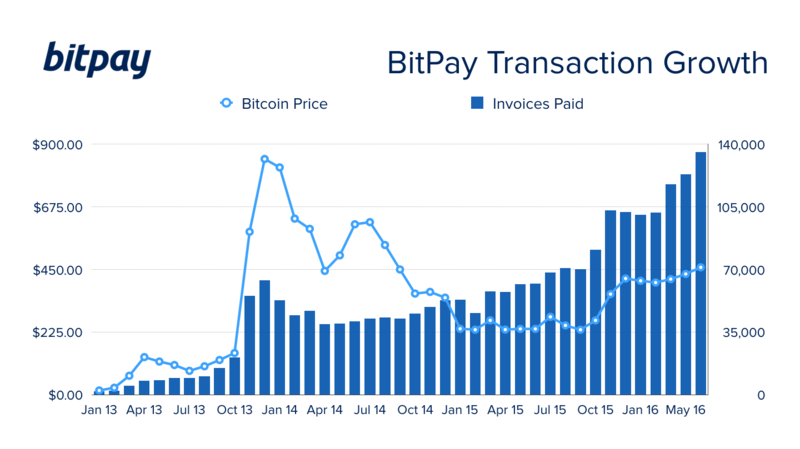 The BitPay spokesperson quoted earlier told Mattermark that their firm has seen “record transaction growth month-over-month since the latter part of last year.” BitPay went on to state that “much of [that] growth was happening even during times when the bitcoin price was trending downward.” So bitcoin’s consistently increasing usage can occur in the face of price declines. If bitcoin is the native currency of the internet, why isn’t it growing as quickly as your favorite social media app? Because for most people, bitcoin still offers little improvement over traditional fiat currency, and it’s a hassle to deal with. Under certain conditions, however, bitcoin does offer advantages that encourage users to go the extra mile. For many bitcoin startups today, it’s a critical question, as the measured pace of consumer adoption poses potential problems. The majority of these firms sell bitcoin-related services, forgoing mining bitcoin directly. Their value propositions rest on bitcoin being a viable currency rather than a speculative asset. The volume that bitcoin-as-currency could bring may drive demand for the two-sided marketplaces that currently hope to take a piece of transactions on their platforms. Meanwhile, venture capitalists have continued to vote with their dollars that cryptocurrency startups are not passé. That said, investment does seem to be slowing. Mattermark editor Alex Wilhelm reported in April that “the first quarter of 2016 was the second most active period in terms of total dollars raised for bitcoin firms in at least the last two years.” By comparison, current sums from both Mattermark and CoinDesk data put the current tally of venture investment into bitcoin-related startups at just over $40 million so far in the second quarter. Despite that, well-funded companies like 21.co, which aims to nurture bitcoin’s developer ecosystem, may be headed in the right direction. New applications of bitcoin as a technological platform could be the key to spurring consumer growth. These worries are countered by optimism from the miners themselves. Marco Streng, the CEO of Genesis Mining, told Mattermark on the phone that new miners are quite eager to get started. 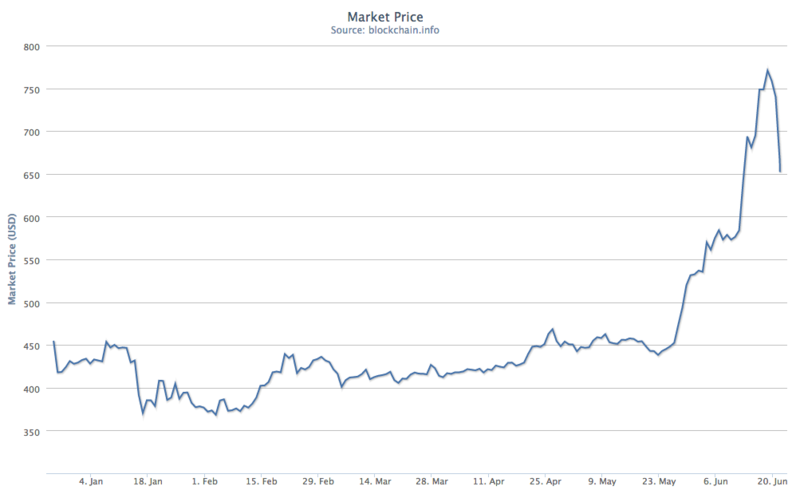 Bitcoin’s price is spiking ahead of technical changes. 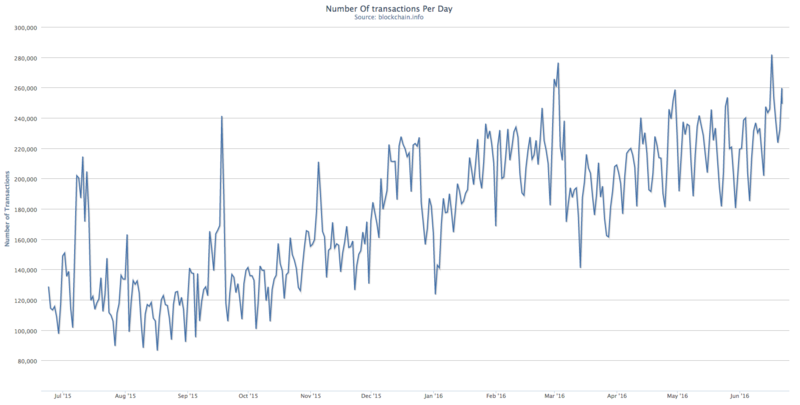 Transaction volume continues to grow over time, but the pace is likely slower than some had expected. All the while, venture capitalists are still investing, albeit at a reduced pace compared to prior highs. The jury is still out on bitcoin as the next big thing, keyword being “big”—the core users obviously love it, but will everyone else? Featured Image via Flickr user Jason Benjamin under CC0 1.0. Image has been cropped.